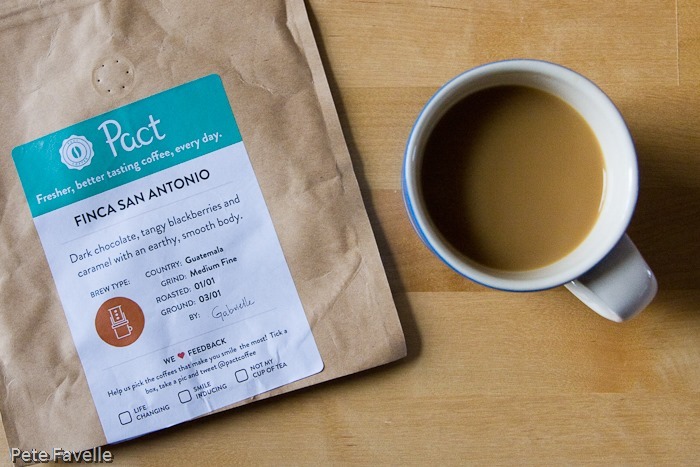 The great aspect of Pact’s coffee subscription is the option to have a different coffee arrive every delivery. Although their range only has five coffees at any one time, there’s enough turn-over that there always seems to be something new to try. Finca San Antonio is a Guatemalan coffee and as before, there’s a wealth of information on the Pact website – if you can find it. Once a coffee has gone from their range, the detailed page is no longer listed – but if you guess the name of the page, it’s still there. 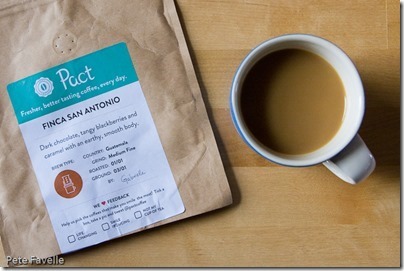 While obviously you want to drink coffee while it’s as fresh as possible, it’s a shame that Pact can’t leave those pages more visible for a little while after they’ve finished shipping a given bean. Anyway, enough moaning and on to the coffee! The grounds have a warm, fruity aroma with black cherries and a subtle, toffee sweet background. There’s also just a hint of earthy notes, like sun-baked soil. Brewed, a more nutty character comes through, the fruit is less pronounced and the toffee lost entirely. Medium bodied in the mouth, there’s a little sweetness and black cherry fruit, slowly joined by an initially gentle but growing tannic bitterness. The finish is short, and surprisingly dry. This is a nice enough coffee; not particularly complex but strong enough to have some decent flavour. 2.5 stars.